Australia has a wide range of climates from the wet tropics to cool temperate climates and it is important to consider your climate when selecting trees that will be best suited to your area so they will thrive and be productive once planted. 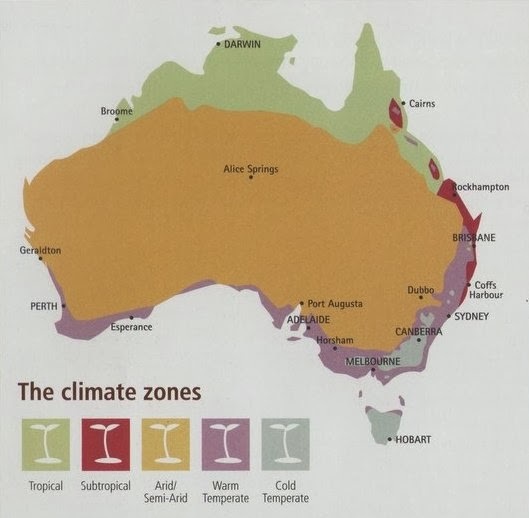 This map from the Organic Gardener Magazine is an excellent example of a climate map that will help you to understand what type of climate you live in. Growing plants that are well suited to your climate will ensure you have success, while trying to grow unsuitable plants may result in you becoming discouraged when they do not thrive and they may also be more susceptible to stresses that increases the risk of pests and diseases problems. This is not to discourage the passionate gardeners out there who are always very keen to try growing plants well out of their natural climates and who have some wonderful success stories to tell. If you are new to gardening it is a good idea to start with something that is ideally suited to your climate so that it will flourish and your success with one thing will inspire you to grow more and garden more. Understanding your climate is just the beginning as every garden will also have its own microclimate. Consider the aspect of your land, does it face north, south, east or west and where the sun is at it hottest. Where are your shady, cool damp spots and do you have a cold frost gully where the cool air pools on cold winter nights. Do you have a sheltered sun trap, do you have bare north facing walls that can be used to reflect the heat back onto heat loving plants during the winter. Understanding the lay of the land will be essential in helping you select the ideal positions for you favourite trees. Harvest with Freshly Picked Home Grown Produce.